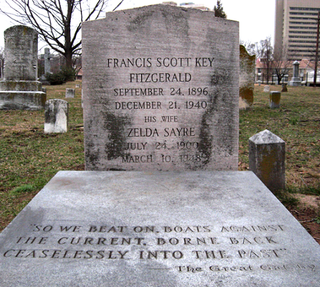 F. Scott and Zelda Fitzgerald are buried next to each other beneath a headstone bearing this quote from The Great Gatsby: “So we beat on, boats against the current, borne back ceaselessly into the past.” Poor Zelda! Even in death, she can’t escape the novel written largely in part to make fun of her. Flannery O’Connor’s grave in Milledgeville, GA gets decorated with coins and toy gorillas. The original plot where Edgar Allan Poe was buried, also in Baltimore, is marked with a Raven. Dead Poe gets around, though — his body has been moved and reburied twice. A portion of Truman Capote’s ashes are kept at the Westwood Memorial in Los Angeles in close proximity to the graves of Natalie Wood and Marilyn Monroe. The rest of the ashes were scattered on the east coast or kept by Joanne Carson, wife of Johnny. The grave of Zora Neale Hurston remained unmarked until 1973 when Alice Walker worked to put a headstone in place. Her epitaph now reads “Genius of the South.” My eyes. They have tears in them. So what do you say? Ouija board? Seance? Contact all of these authors and we might be able to throw together a some sort of resurrected Algonquin roundtable.